Thanks to everyone who braved the bad weather reports and came out and shot the Pumpkin Buster on Sunday. Our shooters were rewarded with a clear day of shooting with not even a sprinkle of rain. We also had a Celebrity Fossil at the shoot! 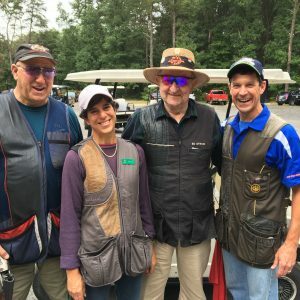 Nice to see Ed Stroik out crushing some clays. A good time was had by all, although a few said that there was a wascally wabbit that was giving them fits. Congratulations to Michael Parkhurst who handily won the Main with a 95. Rodger Becker was M2 with A 90 and Grace Callahan came in third and won Ladies with an 88. On the Woods Course, Rodger Becker edged out Parkhurst and Glen Lewandowski’s twin 96’s to win top honors with a 97. Grace Callahan came in third and won Ladies again, this time with a 94. A special mention- George Rossi continued his winning streak on his State Championship tour and tied for first with Bill Damora in C Class with an 81. What a way to celebrate your birthday! Nice shooting Big George & many happy returns! Full scores and payouts are up on iclays.com. 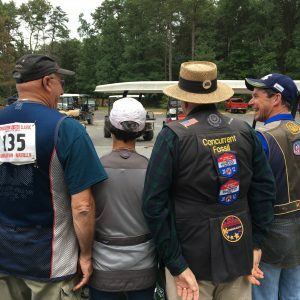 Hope to see you all at the November Blast on November 6th, when we will have all simos on the Main Course and Sporting on the Woods Course.